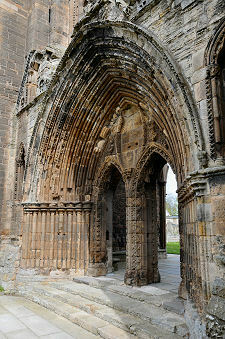 To the 21st Century visitor Elgin Cathedral, even as a ruin, is an awe-inspiring place. What must it have been like as a complete building, a colourful and majestic symbol of the faith of all who worshipped here? The first known church on this site dates back to the 1200s, a cross-shaped building much smaller than the ruins on view today. This was enlarged later in the same century, possibly following a fire. The result was a building some 280ft in length, taller than the original and with a new choir and an octagonal chapter house. After St Andrews this was the second largest cathedral in Scotland. Some badly judged local politics led to the burning of the Cathedral (and much of Elgin) in 1390, by the Wolf of Badenoch. This was the name given to Alexander Stewart, the younger son of Robert II. The Bishop of Moray, Bishop Alexander Bur had caused him to to be excommunicated for marital infidelity, and this was his way of getting even (see our Historical Timeline). The destruction was followed by a programme of repair and reconstruction that lasted intermittently through the following two hundred years. Further work was needed following the collapse of the central tower in 1506, and the west front and chapter house received facelifts at around the same time. 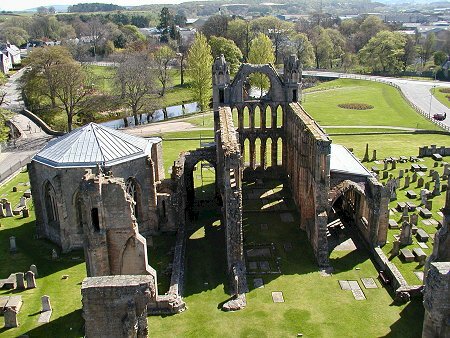 Sadly, the Lantern of the North, as Elgin Cathedral is still affectionately known, fell victim to the Reformation of 1560. 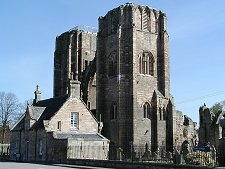 The mass and the Pope's authority over the Scottish church were rejected and though many cathedrals survived in use as parish churches, in Elgin the congregation simply moved to the parish church of St Giles in the town. The cathedral fabric soon began to suffer. In 1568 the Regent Murray removed the lead from the cathedral's roof and the bells were also taken away. And in 1637 the choir roof blew down in a gale. The cathedral still saw occasional use, but insufficient to justify repairs. Much of the inside was robbed out, and the rood screen was destroyed to provide firewood. But the greatest single disaster was the collapse of the central tower in 1711, taking with it the greater portion of the nave. 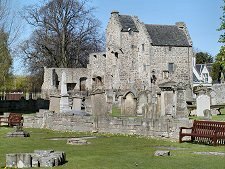 The only part of the structure kept in reasonable order from that time was the chapter house, which was used as a meeting room for the Elgin tradesfolk. It was not until the early 1800s that any effort was made to halt further decay. In 1807, John Shanks, a drouthy cobbler was appointed keeper of the cathedral and his single-handed efforts to clear the collapsed masonry led to the preparation of a report seeking to highlight the steps required to stabilise the ruin and improve the cathedral grounds. The resulting project was a joint venture between the Office of Works and the Burgh Council. Shanks' personal reward was an increase in salary. Modern visitors can only imagine what a building of such size and status must have looked like in its prime, though a model on display does help. But even though it is now a ruin, there is still plenty to see and marvel over. 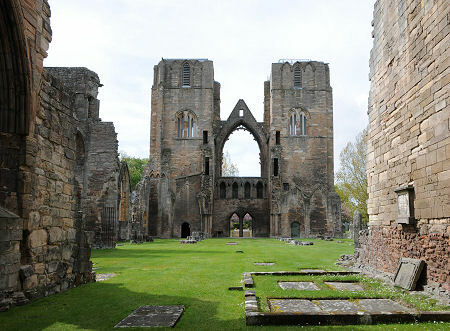 Elgin Cathedral's west front is one of the finest pieces of architecture in Scotland and the two western towers date from the final stages of the first building phase. A climb to the top of the north west tower offers breathtaking views of the surrounding area and an appreciation of this as the chosen site for such a building. But if you suffer from vertigo you will certainly think twice before climbing the last few stairs to the platform now surmounting the tower that, though perfectly safe, feels very exposed. Sadly, little remains of the nave, though the ruins of the inner walls reach full height where they abut the towers, showing that it was two stages high. The two transepts represent the most complete part of the first church, and they also had two stages. 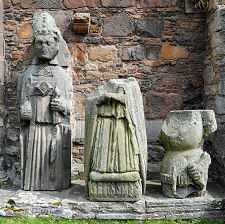 Nothing remains of the great central tower, but three stone figures, one of a bishop, one of an ecclesiastic and another of a knight are now on display in the south-east corner of the nave. They originally sat in large niches high up on the western angles of the tower. Of the cathedral church, the choir and presbytery are the most complete parts remaining. These were rebuilt in the late 1400s. The aisles and chapels flanking the choir have been altered, but the vaulted roofs that cover them are still essentially as built after 1270. The tomb of Bishop John of Winchester, Lord Bishop of Moray which is found here, is the most complete in the cathedral. 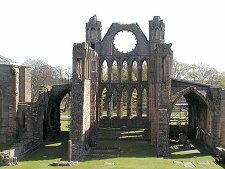 In its present form, the chapter house is substantially as it was rebuilt in about 1500. Those with an eye for detail, and the right light in which to view it, can still see traces of gold paint on the elaborate vaulting. 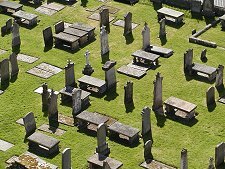 And before you leave, take a walk amongst the tombstones outwith the cathedral buildings. Here you'll find a memorial to John Shanks, the drouthy cobbler and many others for whom this place was the embodiment of their faith. 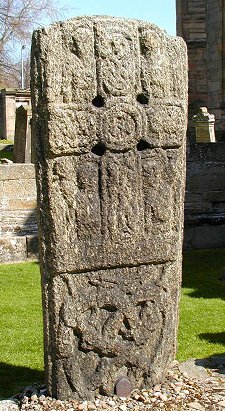 There is also a rather fine Pictish cross slab on view, suggesting the possibility of a religious use of the site dating back much earlier than the earliest known church in 1200. 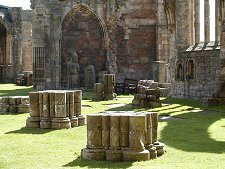 And while you are visiting Elgin Cathedral, don't overlook the nearby Bishop's House, which can be viewed externally, and the Biblical Garden.